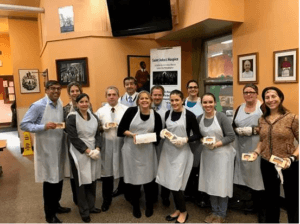 Eric B. Pearson, managing partner at Pearson Koutcher Law, collaborated with The Workers’ Compensation Section to serve a holiday lunch for 350 people at Saint John’s Hospice for the second year in a row!!! In addition, the Section made a $1,500.00 donation!!! Saint John’s Hospice, founded in 1963, is a charitable organization that serves homeless and others in need. Located at 12th and Race in Philadelphia the members of Saint John’s work to provide dignity and respect to every guest and are proud to serve all without discrimination. At Pearson Koutcher Law, our Philadelphia Workers Compensation attorneys have extensive experience representing clients injured in all types of workplace accidents and as a result of various on-the job hazardous conditions. We understand the complexities of medical diagnoses and work hand –in-hand with your medical care provider to properly address your needs, get you better and get the benefits you deserve under the Pennsylvania Workers’ Compensation Act. Call us to today at 215-627-0700 to set up an appointment with one of our knowledgeable lawyers to discuss your rights and options.